CVD Manufacturing Inc. - Building a CVD plant. Manufacture of Net Shapes, Parts, and Tool Inserts. Purification and Reclamation of Contaminated Metals. Our design, engineering, construction, provisions for training services and assembly of turnkey chemical vapour deposition plants are all fully licensed by the environmental protection agencies of the governments in Canada, U.S., E.U. countries and Japan. The CVDS team has licensed, designed, built and commissioned an MOCVD plant in Germany. CVDS has licensed three other corporations, SpaceOptix, CVMR, and CVD Manufacturing (U.S.) Inc., to use its patented technology. Work is partially completed for the licensing, design, construction and commissioning of two new CVD plants in Canada and the United States. 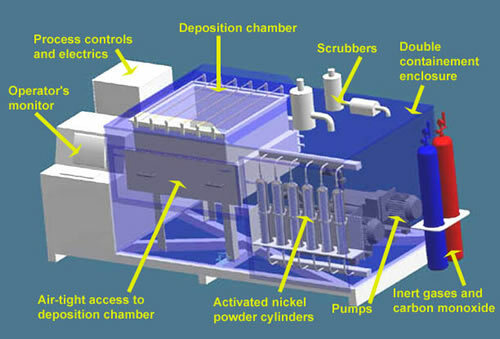 Self-contained Nickel Vapour Deposition system; to be customised for individual customer needs.